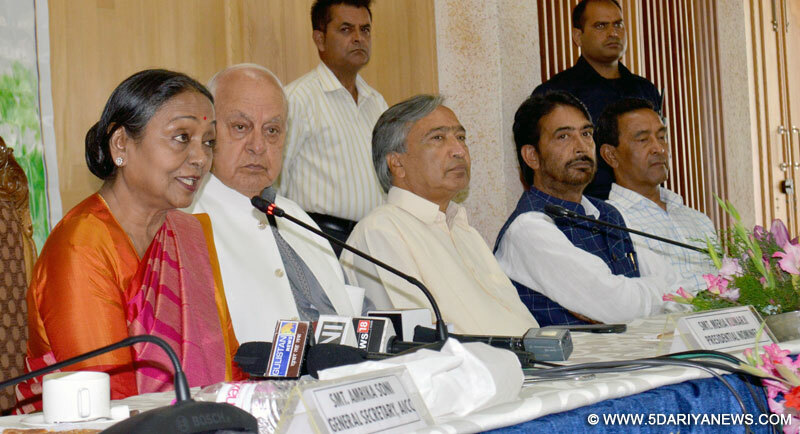 United Progressive Alliance's (UPA) presidential candidate Meira Kumar here on Sunday said the ideologies and principles India believes in are in danger and once again urged for conscience votes in the July 17 poll for the country's top post.The former Lok Sabha Speaker and senior Congress leader visited Srinagar to seek support from legislators of the National Conference, the Congress and Independents. She said the opposition wanted to make the presidential poll as one fought on principles. "These are the principles which are close to my heart and to the hearts of most of the people of this country. India is united because we believe in these principles. "There are so many religions in the country, so many cultures, ideologies, and languages, but despite that the country is united only because of these principles. "The UPA candidate said that dangers lurking against such principles and ideologies needed to be checked.She said she had written to all MPs and MLAs, irrespective of the parties or states they belonged to, and told them that the July 17 poll was a historic opportunity to take a decision to make the country move forward and make a new India according to new thinking in the real sense. Meira Kumar said that when such historic decisions are to be taken, the voice of the conscience has to be heard. "So, I have appealed to them to listen to the voice of their conscience and support me," she said. The UPA nominee is pitted against am Nath Kovind of the ruling National Democratic Alliance.